Sorry to wake you but we have an emergency. If you can't give me more nurses, back in you go! Your break is over, get out of there. Its my turn to escape! These darn new grad nurses! Didn't I say only THREE wishes! Nurse can you do something about my back? It's a bit cramped in here. It doesn't matter how many times you wish. I cannot give you better patient ratios. Nurse, I gave you 3 wishes! Plleeeezze use one of them to get me out of this thing! I know we always see crazy things here on Halloween but, seriously? You knew this wasn't physically possible, right? I believe this will be fun. I think we'll easily get 100+ captions so make sure you submit your caption(s) ASAP. Create a LOL sharable caption. Why not give it a try? It's free. You could win $100! To participate please follow the Caption Contest Rules below. Everyone is allowed to participate! You may submit multiple captions. A TOP 8 Captions Poll will be created 30-40 days after the start of the contest by allnurses.com. You, the community, will select the winner. The caption with the most votes win. The Winner will be announced 60 days (give or take 1 week) from the start of the contest. 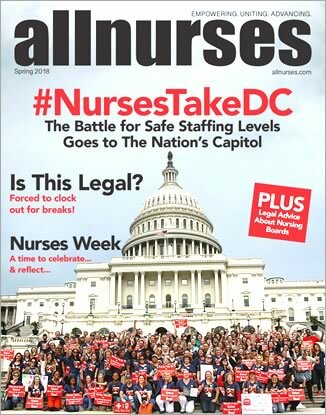 Captions must be posted on allnurses.com to participate. Captions must comply with our Terms of Service. Thank you. We had a lot of great captions! It's now up to you to select the winner. Top 8 Captions Poll is now available! Cartoon can be viewed at Safer staffing? Your wish is my command. Nurse, I gave you three wishes! Plleeeezze use one of them to get me out of this thing! Only a nurse is able to bring a ghost back into his bottle. Sorry Master, I didn't realize your command to PRESS DOWN WHILE TURNING, wasn't meant for me! !